The world is your classroom at Lynn, whether you’re on campus or abroad. Nearly one in every five Lynn students is international. That means you’ll gain global viewpoints in your classes, plus a worldwide professional network when you graduate. Enrich your international experience by choosing from more than 70 study abroad programs in 17 countries. Imagine studying creative writing in Dublin, Ireland, or business and Mandarin in Shanghai, China. Enroll for three weeks, a semester, or even a year. 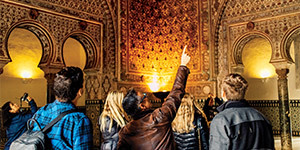 Our Center for Learning Abroad will help you choose the program that’s right for you. Lynn embraces new ideas, opportunities, and technologies to make learning dynamic and engaging. From our nationally recognized Dialogues core curriculum and award-winning iPad®-powered learning to our accelerated degree programs, you’ll have opportunities unheard of elsewhere. Plus, you’ll gain a global perspective with classmates from close to 100 countries and many study abroad options. Ready to find your style at Lynn University? We’ll make your transfer as smooth as possible. We encourage you to apply by July 1 for the fall semester and December 1 for spring. Get started at lynn.edu/apply. Learn more about transferring to Lynn at lynn.edu/transfer.